Disney’s new film “Christopher Robin” is not to be confused with 20th Century Fox’s “Goodbye Christopher Robin” Last year, “Goodbye” showed us the dark origins of young boy Robin and how the famous characters like Pooh and friends came to be. The latest is a fictional story along the lines of “Paddington” where a grown-up must remember what it’s like to be a child in order to recapture his humanity. From the director behind “Finding Neverland” and “The Kite Runner”, Marc Forster is the ideal choice for this project. He understands how to blend adventure and underlying sorrow more than any modern director. The Oscar winning screenwriter of “Spotlight”, Tom McCarthy and “Hidden Figures” writer Allison Schroeder understand that nostalgia is the key to success with this story. Christopher Robin (McGregor) left the Hundred Acre Wood long ago, now married, a child of his own, and running a luggage company during the aftermath of WWII, he’s forgotten how to have fun. “It’s been years since I have seen you smile,” his wife Evelyn (Atwell) says after he bows out of another trip back to the cottage where he grew up. That’s when something strange happens. Christopher’s childhood friend Pooh (Jim Cummings) appears on a park bench in London. At first Christopher thinks he has gone mad, how can an imaginary friend from his childhood be here in person. “It’s not stress, it’s Pooh!” the honey loving bear replies. Pooh needs Christopher’s help finding his friends, but not before causing some chaos in Christopher’s very busy world. Pooh’s overall portrayal here is both that of an elderly grandparent and of an innocent child which is endearing. Have you ever noticed how children’s stuffed animals always look slightly sad and pitiful? A psychological selling tool, it’s also used here, especially in the design of Pooh over the other characters. The beloved characters are not simply animated but look as real as Caesar in “Planet of the Apes” or Gollum in “The Hobbit”. The concept here is making the icons looks like plush toys that have come to life. Voice actor Jim Cummings has been Pooh since the 80’s, marking the first time an animated character’s voice has also been used in the live action version. Brad Garrett hilariously voices Eeyore, who surprisingly gets more screen time and plot initiative than Piglet or Tigger. However, it’s the more somber moments of “Christopher Robin” that really captivate. Pooh’s overall portrayal here is both that of an elderly grandparent and of an innocent child which is endearing. The plot of the film has some structural issues and takes a while to manifest. There are a lot of introductory moments from the preface story told in the opening credits, to an emotional childhood farewell for young Christopher, then an introduction to adult Robin. It’s doubtful that younger children will be as entertained by a story that directly speaks to adults. Ewan McGregor (“Moulin Rouge”) is the main star here, not Pooh, it’s about his journey physically and emotionally. Forster holds off on allowing this film to get silly for as long as possible, it’s not until the final act that “Christopher Robin” turns its focus more kid-friendly with predictable antics. Morals and life lessons flourish, but most are aimed at adults, not children. 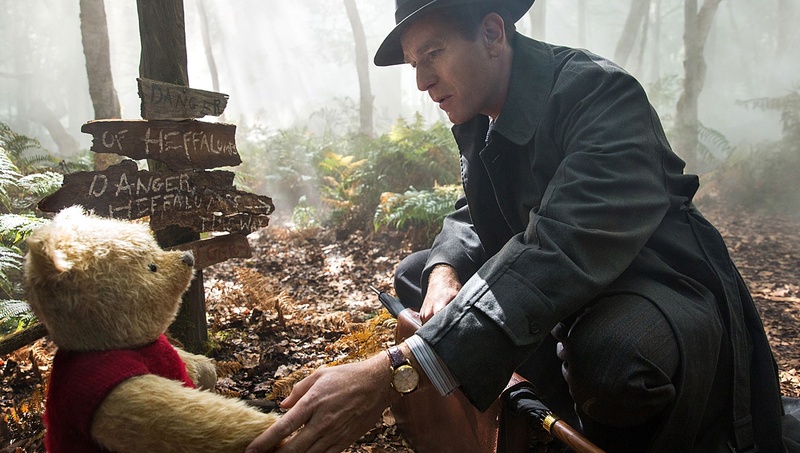 Disney’s “Christopher Robin” is a heart-tugging nostalgia trip for adults.